How often is it that one tries to change the subject, and randomly picks another word that sounds exactly like the word they're trying to avoid? Probably not often. The other blog became the focus while we got all used to the idea of a baby, but now the idea is starting to settle in and I must write about other things once in a while. After several weeks with very little updating, I've vowed to post here more often. I have also vowed to read more (non-pregnancy-related books) and found this link today, and have vowed to do it! I have started Infinite Jest several times, but have never finished it, and this is the summer for it. Any bookies, feel free to join me. I may post some thoughts about the book as I go. 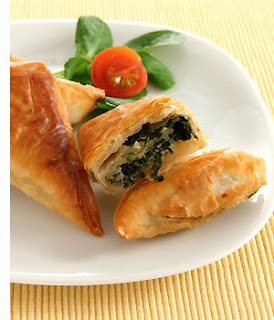 I absolutely LOVE spanakopita and should've simply ordered thirty of them to hoard for the summer.